The Etsy store is now up and running. Please take a look, I'm going to be continually adding more pieces. I've been busy working on a number of different pieces in the studio. 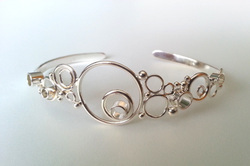 Here's a sneak peek at of a cuff I'm working on in my Bubble Collection. It's just waiting for gems to be set. Continuing on with my creation of the Viscountess's coronet. Not that all of the pieces have been cut out and the hinge jigs are prepared it's time to solder on the hinges. Personally, I'm a fad of using hard solder on pretty much everything, and it's especially important when soldering something that is going to be enameled, as the firing process can cause the solder to flow and pieces to fall off. My plan was to use eutectic solder with has a higher melting temperature than hard solder but due to the size difference between the plates and the hinges I was ending up with melted hinges so I reverted back to hard solder. 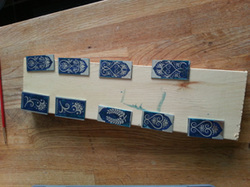 Once the hinges were soldered on it was time to begin enameling. To the let you can see the enamel as I begin to layer it into the recessed areas. I try not to spread the enamel to far out of the recessed ares to avoid excess clean up afterword. 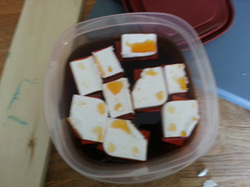 The powdered glass is mixed with water and a binder to temporarily glue the glass in place until the piece is fired. This process is repeated multiple times until the desired results have been achieved. Once the enamel has been fired into place and the recesses are filled, each piece is then ground down level and wet sanded to a fine finish before re-firing the pieces a final time. Each piece is then brought to a high polish finish before the pieces and joined at the hinges and the pearls are fixed to the posts at the top. Here is the finished coronet as worn my the lovely Viscountess Sina. A few years ago my husband joined the SCA (http://www.sca.org). For those of you unfamiliar with it, here is a brief introduction from their website. Now my husband joined for the fun of the armoured combat. Where else can you make your own armour and go fight each other with sticks. I haven't made it to many of the events but I'm getting to know a lot of people and starting to try to get into the arts scene in there. I'm always been a fan of history so what better excuse to look into my interests more than finding a hobby to match. Last summer a friend of ours approached me, she was just stepping up as Princess of Avacal, and she wanted to have me make her coronet that she would wear as Viscountess after she finished her term as Princess. Finding out I love to enamel was just the icing on the cake! Within the SCA we try to keep things period. There are a many cultures and time frames from which to choose. 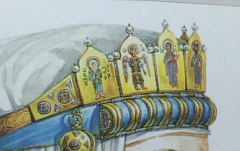 For this project we are working with a Russian persona, and this is the reference she provided me with for the type of coronet she wanted done. A series of enameled silver plates, hinged, topped with pearls to be secures to the head with a ribbon tied to the back, and without the religious iconography. And so the designing began. We wanted to make sure the wreath of laurel leaves was included as she is a member of the Order of the Laurel (a rank of peerage within the Arts and Sciences), otherwise I was free to design as I saw fit. I wanted to stick with the Russian designs and spent a great deal of time looking searching for medieval references of jewellery styles. What I discovered was that the enamel pieces tended towards pattern and ornamentation that reminded me of some of the Russian embroidery I had seen. After going through many images I sat down and started sketching, making my own variation of these patterns which I thought would suit this piece. This is the finalized design I came up and got the go-ahead to start creating. The black areas will be the metal showing and the whites areas will be etched away and willed with enamel, a powdered glass that is fused to the silver. 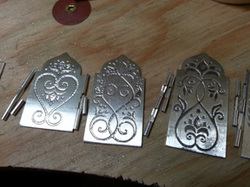 Here we see the pieces of silver after they have been prepped for etching. The etching process requires the metal be grease free, and spot that is not free of grease will not etch (I have seen pieces that ended up with fingerprints show up after etching when the metal isn't clean enough) I then ironed the resist onto the metal (I may do a more in depth explaination of this etching process at some point, but for now I'll just stick with a brief rundown) and sealed the back and edges of the metal, essentially anything I didn't want to etch and touched up a few spots that didn't iron on well. At this point I attached the sliver to styrofoam pieces and had them float in the etching solution. The floating is necessary depending on what type of etching solution you are using. I personally have now interest in working with the harsher acids, this ferric nitrate solution is works just fine for me and is not as harsh of a chemical as having to work with nitric acid. They sat in the solution etching for a few hours before being neutralized and cleaned up. Here are a few of the pieces after being cleaned up and cut out. Designer, Artist, Mother of one with more ideas than she knows what to do with.